We at Geeky Hobbies would like to thank Anima Project for the review copy of Anima Gate of Memories used for this review. Other than receiving a free copy of the game to review, we at Geeky Hobbies received no other compensation for this review. Receiving the review copy for free had no impact on the content of this review or the final score. In Anima Gate of Memories you play as two characters that are linked. The Bearer of Calamities is a girl who has forgotten her name and her past. Ergo is an ancient monster who has been trapped inside a book. These two must work together to stop an evil that threatens the world. 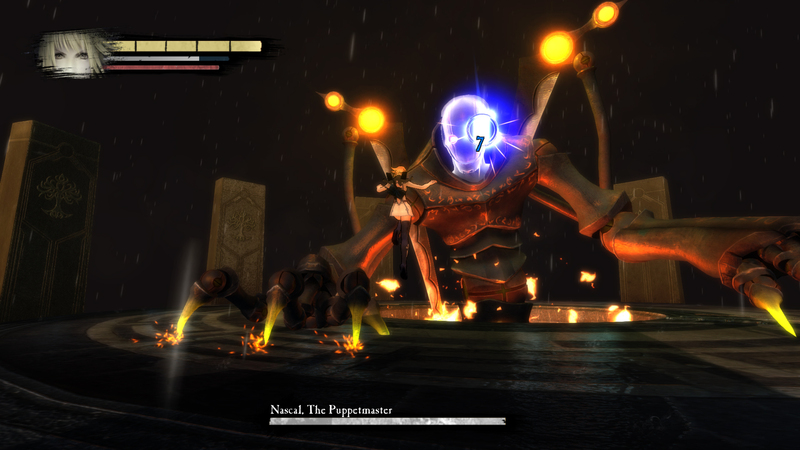 Anima Gate of memories is based on the tabletop RPG Anima: Beyond. Anima Gates of Memories is an action RPG. The main game mechanic is the combat which is fast paced and focuses on building up combos. The combat reminds me a lot of games like Devil May Cry. The game includes some RPG elements where you earn skill points that you can use to acquire/upgrade various skills. The game also has items which you can use to increase your stats. The combat in Anima Gate of Memories is good and is probably the best part of the game. The combat features ranged and melee attacks and you need to combine the two together to create combos. The combat is pretty quick and involves a lot of dodging and chaining attacks together. I think the combat sometimes relies on spamming attack buttons. The controls work pretty well for the most part but there are times when the controls feel a little unresponsive. I would highly recommend using the lock on mechanic since it is a pain trying to rotate the camera to see enemies while also trying to attack them. The combat is fun but has some flaws. One “unique” feature of the game is that you control two characters that you can switch between at any point with the press of a button. I like this mechanic and it showed some promise but it doesn’t live up to its’ potential. Both characters have their own upgrade tree which you think would make the two characters play differently. In my opinion they both play pretty much the same. None of the upgrades seem significantly different between the two characters. The equippable items don’t seem to change anything other than underlying stats. The game has customization options but doesn’t really utilize them much. What most people (including myself) are probably going to end up doing is have one character be magic/ranged and the other character be the melee character. The game really doesn’t reward you for approaching the game in any other way. Letting each character focus on one type of attack lets you use all your upgrades and items to improve that type of attack for the character. Since you can switch between the characters at any time, there is really no reason to balance out each character individually. The biggest problem I have with the gameplay is the jumping. The game is not a platformer which is a good thing since the game would be in a lot of trouble if it was. The jumping feels floaty and is just annoying. The jumping works for combat but is not precise enough for platforming. The game doesn’t appear to have any really difficult platforming sections but the game’s jumping mechanics make the platforming sections much more difficult than they should be. This is because it is hard to judge how far you have to jump and it is hard to control your jumps. This leads you to missing platforms that you shouldn’t have any trouble reaching. The second “world” requires quite a bit of jumping which can become quite frustrating because of the controls. Difficulty wise I would say the game is moderately difficult. The game is not tear your hair out frustrating but it is not easy either. The boss fights that I have encountered so far are challenging but not impossible. This is not Dark Souls difficult where you can spend hours trying to beat a boss but is also not the type of game where you can beat the bosses on your first attempt. You need to learn their attacks and learn how to dodge/evade them. The boss fights do get frustrating at times because some of their attacks end up chaining together since you can’t recover in time and they knock you off the level quite a bit dealing additional damage. This makes the bosses feel a little cheap at times but you do feel a sense of accomplishment beating them. Other than the boss fights the game sometimes suffers from not giving a clear idea of what you are supposed to do next. I got stuck in one area because I couldn’t see these little symbols printed on the wall. All the game tells you is that the doors are locked by puzzles. The symbols kind of blended into the wall and until I realized that they were there I had no idea what I was supposed to do. I am not saying that the game should hold your hand guiding you through the game but the game could have done a better job guiding you towards figuring out how to proceed on your own. Overall I found the story to be interesting. The game has a well developed backstory and world. The plot seems interesting and has potential. The problem is that the game tends to not fully explain everything and throws a lot at you at times making the story a little hard to follow at times. I thought the voice acting was decent, not terrible but not the greatest either. I know that some people are going to hate it though as some people will probably find it to be annoying. The game’s graphics are pretty good. The game’s locations show detail and are creatively designed. The character models are pretty good. It looks like a lot of time was put into the graphical style of the game. What I find weird though is that most of the cutscenes of the characters talking to one another aren’t animated. The characters slightly move but their mouths don’t move at all. For some reason this really took me out of some of the cutscenes. At this point I have not completed the game so I can’t give you a precise length for the game. I would say that I have completed about a third to half of the game and have been playing for around five hours. I would guess that the game is about twelve to fifteen hours long. The game apparently has multiple different endings so if you enjoy the game you could play the game multiple times to get the different endings. I personally don’t see myself wanting to play the game more than one time though. I really don’t know what to think of Anima Gate of Memories. The game has a interesting story that is sometimes confusing. The combat is fun but kind of clunky and relies a lot on dodging attacks and spamming attack buttons. The game is moderately difficult and usually feels fair except for some cheap attacks by the bosses. I like the idea of the two playable characters but the game really doesn’t do much with it. The graphics look nice and the game has some great looking environments but at the same time the characters are regularly not even animated in the cutscenes. The game has a lot of potential but feels unpolished. Anima Gate of Memories is a solid but unspectacular game. If you really like the theme or games like Devil May Cry it may be worth picking up Anima Gate of Memories at full price. Otherwise I would probably pick up the game during a sale. If you would like to purchase Anima Gate of Memories you can purchase it on Steam here. The combat is pretty fun and the game's environment/story is interesting. The game is around 12-15 hours and has replay value due to multiple endings. The combat is clunky at times and feels kind of repetitive. The story can be confusing at times.